Quick and easy, it might be tempting to set up a link to a PDF version of your restaurant’s menu – but it’s a terrible idea. Find out why and what to do instead. For restaurants, few marketing tools are more effective today than a website that is well optimized for search. Whether customers are looking for your restaurant specifically after hearing about it from a friend, colleague or even someone on social media, or they are searching online for a restaurant in your city, getting found in online search is critical. In 2014, Google added menus to its search results, meaning if someone searched a specific food that you offer, your menu could potentially show up in the results. However, if your menu is presented as a PDF, it won’t be crawlable, and you’ll miss out on that opportunity. This simply means search engines can index your menu so it shows up more frequently when people search related keywords. 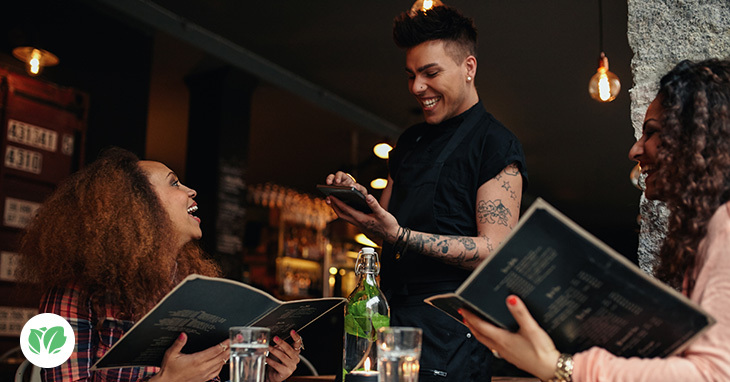 Last but not least, another important statistic can be found in The National Restaurant Association’s 2017 Restaurant Industry Pocket Factbook: 30 percent of consumers say technology makes them dine out or order delivery from a restaurant more often. In addition, the third most popular activity for tablet owners searching for restaurants online was to research specific menu items. Today’s consumer wants information at their fingertips – literally. They are likely to search online for restaurants in a variety of ways, from the restaurant name to its neighborhood, type of food or specific menu items. When they find what they are looking for, the vast majority will take action within one hour; in fact, 85 percent of online searches for restaurants result in purchases, according to a Telmetrics/xAd study. Restaurants that get found online more often have a serious advantage when it comes to acquiring new customers and growing more quickly. It’s the most important marketing strategy for restaurants today, given that nearly everyone (more than 97 percent of consumers) searches online for local businesses, including restaurants. It’s not enough for your restaurant to get found online in local searches when searchers type in the name of your restaurant or even the type of food your restaurant serves. To fully optimize for search, your restaurant’s menu must also be searchable, which means that if the only version of your restaurant menu available to web visitors is a PDF, your restaurant is going to miss out on many searches. PDF documents are a great addition to your website as a download for customers that want to print out your menu and tape it to their fridge or cubicle wall. However, you also need to have a text-based version of your restaurant menu on your website, so that even the individual menu items can help your restaurant get found online. Both restaurants have websites that are aligned with Google’s best practices for search engine optimization, and both are mobile-friendly. Each of their sites get found online in searches for “restaurants” and “Thai restaurants” in their city. However, while the Top Thai Restaurant only has a PDF version of their menu online, the Best Thai Restaurant provides both a PDF version as well as a text version of their menu, laid out over several pages including drinks and appetizers, entrees, lunch, happy hour and late night. Search engines like Google favor larger websites – sites with more pages tend to do better. Their text-based menu is fully searchable, which means local customers can search for Thai restaurants with the best individual menu items. Laying out their menu across several HTML webpages nearly always results in site visitors viewing several different pages on the website, which sends another positive signal to search engines that the website deserves better placement in search results. While PDF space is limited, allocating several pages to their menu items means the Best Thai Restaurant can also post photos of all of their menu items, enticing site visitors visually. Likewise, the Best Thai Restaurant can add customer reviews to their menu’s webpages, offering social proof to convince website visitors to convert (eat there!). In addition to improved placement in search results and the potential to appear in many more searches, the Best Thai Restaurant’s SEO strategy means they have access to more metrics. With access to more data, they can see where site visitors enter and leave, and the pathway they take on the website. By understanding visitor behavior, they can further maximize their digital marketing results, determine which menu items are most popular for use in promotions and find ways to get website visitors’ contact information (such as encouraging them to subscribe to emails) so that they can engage local customers over time. Optimizing your restaurant website to get found in Google searches more often can lead to more website visitors, more customers, more word-of-mouth and more growth. Be sure that you are taking advantage of the space your website offers by including a search-friendly version of your restaurant menu online. Did you know our restaurant financing tools can be used to fund marketing and advertising initiatives, including website development, search-optimization and digital ad campaigns?